NineteenTeen: Between Silk and Sand is Here...an Excerpt. I'm still dancing round the room (well, metaphorically anyway) over the release of Between Silk and Sand, just released on Tuesday from Book View Cafe. 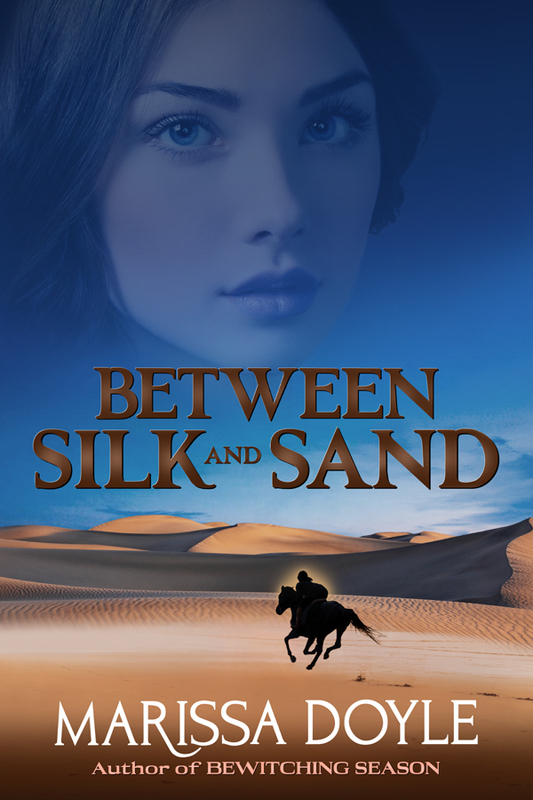 While I've posted a first chapter sneak-peek sample of Between Silk and Sand on my website, I thought it would be fun to give our dear NineteenTeen readers a further sneak-peek into the story...one that occurs at a pivotal point in the story. Enjoy! Saraid managed not to visibly jump—probably because she was too tired to do so—and turned. A man dressed in Adaihan robes, his hood drawn partly across his face, leaned against the door the innkeeper’s wife had vanished through, though far back enough that she couldn’t get a good look at him. “It seemed to make sense,” she replied. His accent was different, crisper, though with a trace of the Adaihan vowels she’d heard in the speech of the innkeeper and his wife. Was he the traveler occupying the other room? Whoever he was, chatting with a stranger hardly seemed proper. “I am sure whatever we’re served will be quite edible, Talnith. Thank you,” she said to the man, trying to sound pleasantly dismissive. “My thanks.” The man sat in the chair across from her, putting back his hood as he did. Oh. Whatever she had expected him to look like, it hadn’t included bright gold hair worn long and a little shaggy, curling around his ears, and the bluest eyes she’d ever seen. His skin was dark, the weathered tan of someone who had spent years in the bright, hot sun. Not that he seemed very old. Somewhere in his twenties, a few years older than she. His brows and eyelashes were the same gold as his hair, and his smile was open and sunny despite the lines around his eyes and forehead that somehow seemed older than the rest of him. “Water! I thought I’d never see it again!” Talnith nearly lunged across the table for the pitcher. She poured herself a cup and gulped it down, then another. “We was dyin’ of it,” Talnith said dramatically, wiping her mouth on her sleeve. “Old Captain Stick-up-the-Pants got us lost when we was hiding from those Day—” She broke off into a grunt as Saraid kicked her foot. “We were somewhat delayed and running low on water,” Saraid said blandly. “Talnith, when you’ve drunk your fill, could you bring our packs to our room?” Where later on maybe Captain Zamas could fit her with a muzzle. Pox it, she’d warned Talnith about watching what she said! The fewer details anyone learned about them, the better. And double poxes on her for ruining the silly conversation they’d been having with him. She hadn’t had such fun in weeks. Talnith glowered but didn’t dare argue. “Yes’m,” she said, and chugged down a last cup of the tea, then followed the innkeeper’s wife through the door. Saraid glanced at the young man. His liveliness seemed to have left the room with Talnith; now he was pouring himself some tea, staring at the cup with a concentration that the simple act didn’t seem to require. Was he thinking about what Talnith had just said? She leaned back against her chair and closed her eyes as she sipped her tea. Maybe if she drank it slowly, instead of slurping it down the way she really wanted to, the man would think that Talnith had been exaggerating. What had he said it was? Palm-mint? Whatever it was, it was delicious—cool and fresh, like the essence of green. If the Adaihans had created this, they probably did know a thing or two about food. When she opened her eyes again, she saw that the young man was gazing at her with a thoughtful frown on his face. His eyes really were an amazing shade of blue, weren’t they? Or was their intensity just due to the contrast with his tanned skin? Maybe—but they looked as though they were used to looking into far distances and had absorbed the hue of a wide cloudless sky. Then she realized that they were staring at each other. He stood up as well. “I think I know what you mean,” he said, making a wry face, and she felt absurdly pleased. And then wanted to slap herself. They were anonymous travelers in a tiny, out-of-the-way oasis in the Adaiha. He’d more than likely be gone by nightfall, and she’d never see him again. “Good ni—or, er, good morning, I suppose.” The inversion of night and day was starting to get to her. She hurried through the door and ran full tilt into the innkeeper’s wife, who listened to her stammered apologies with a bemused expression on her gentle face and showed her to her room. Talnith was already stretched out on a pallet on the floor. Saraid wasn’t at all troubled by her sudden, ostentatious snores as she tiptoed past. The last thing she wanted now was conversation with Talnith. A bowl of gently steaming water, strewn with fragrant herbs, had been set on a small table. Saraid gratefully washed her face and hands and collapsed onto the bed, not even bothering to unbraid her hair. As she slid into sleep, she could still see in her mind’s eye blue eyes gazing into hers. Amazon, Smashwords, and GooglePlay and can easily be ordered in print from your favorite local bookstore.